The chairman of UK bank Alliance & Leicester (A&L), Sir Derek Higgs, has died, the company has announced. Sir Derek, 64, was taken ill suddenly on Monday and died in a London hospital during the afternoon, the bank said. Sir Derek spent more than 20 years working at SG Warburg, now part of UBS, and led a major review of UK corporate governance in 2003. 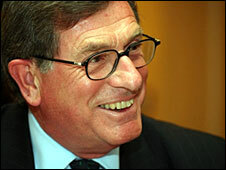 BBC business editor Robert Peston said his death was "a serious loss to the City and the wider business community". A&L's deputy chairman Roy Brown is to act as chairman in the short-term while a permanent successor is sought. In a statement, Mr Brown said: "It was with shock and sadness that we learned of Derek's sudden and unexpected death and our thoughts are with his family. "Derek made an outstanding contribution to British business and was a well-known figure in the City; he was a pleasure to work with," he added. A&L also announced that its chief executive, David Bennett, had recovered from illness and would be returning to work next week. Sir Derek published a review of UK corporate governance in 2003 proposing rules that were designed to prevent corporate scandals similar to the one that had engulfed US energy firm Enron in 2001. Measures proposed by the Higgs review included separating the role of the chairman and chief executive, with the recommendation that a chief executive should not go on to become chairman. It also said that in larger listed companies at least half of the board should be independent non-executive directors. After initial criticism from business groups, the measures were accepted when the rules were introduced under a "comply or explain" regime, rather than making them compulsory.